I love seasonal baking for whatever the time of year or occasion. I believe it adds the final touch to every celebration and a wow factor to a festive table. 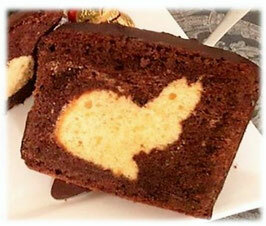 This year my recipe of choice is this Easter Bunny Chocolate Cake. Also, it looks really fancy, creating it was fairly simple. 1. Start by separating the eggs. 2. Beat the butter, 100g of sugar and the package of vanilla until frothy, gradually mix in the 5 egg yolks and beat everything together well. 3. Mix flour and baking powder and fold into the sugar/ egg mass. 4. Beat egg whites with salt until stiff, then add the remaining sugar gradually. Gently fold the beaten egg whites into the dough. 5. Place the dough onto a baking tray covered with baking parchment, spread it and bake for about 20-25 minutes at 170°C in the oven. 6. Let the cake cool down completely. 7. 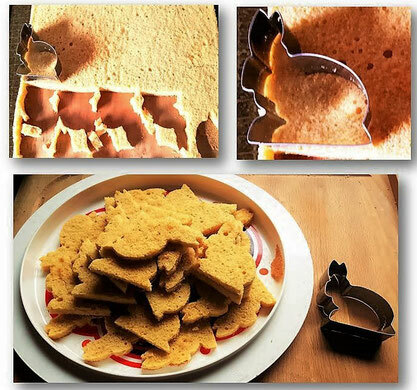 Now take the cookie cutter to cut out the easter bunnies. Try to get out about 20 bunny cookies. Now move on to the dark dough. 1. Repeat steps 1-4 from the basic dough recipe. Then fold the grated dark chocolate and the cocoa, into the dough. 2. Grease the loaf pan. Pour ca. 1/4 of the dark dough into the loaf pan. 3. Place the bunny cookies, densely packed, in one row, onto of the dough. 4. Place the loaf pan into the oven and bake for about 10 min at 170°C. Make sure to check if the bunny cookies stay in place. Should they fold to one side, add some extra dough to the side they lean to. 5. After the 10 min, add the remaining dough to the loaf pan and bake for further 45 to 50 min. 6. Once again, let the cake cool down. 7. To finish, cover the cake with dark chocolate coating/ couverture. Tipp: This is cake recipe is not only limited to Easter celebrations. By adjusting the cookie cutter to the changed occasion (think heart-shaped for Valentine's day, star-shaped for Christmas, numbers for birthdays, and so on), you can make the cake work for every kind of celebration. 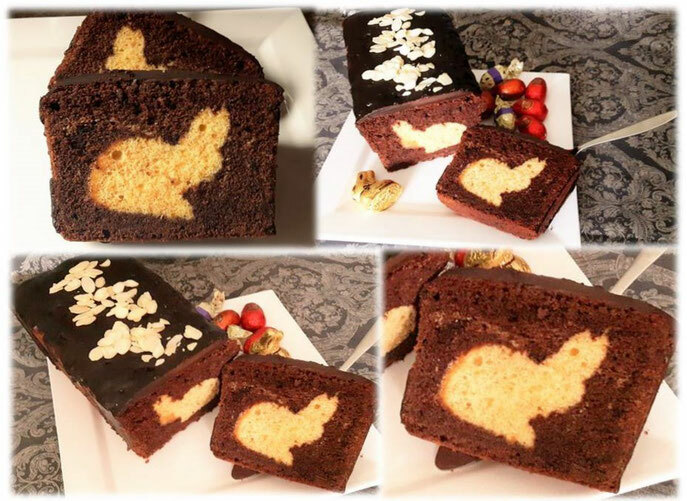 Enjoy baking, let me know if you gave it a try and Happy Easter to all of you. Dieses Rezept habe ich jetzt mit einer Blüte in der Mitte ausprobiert. Super gelungen. Sehr gut geschrieben. Danke!